Dismantling of Johnson St. Bridge postponed until June. 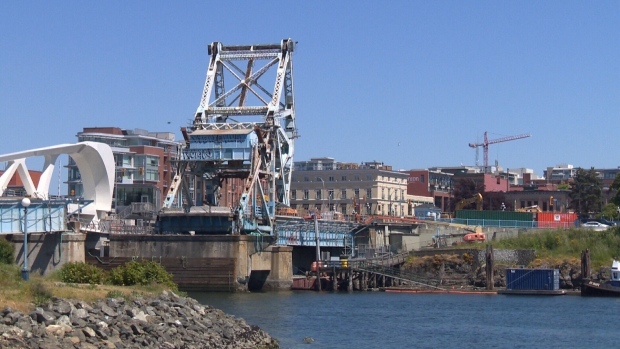 Work on the old Johnson Street Bridge in Victoria, Vancouver Island has been pushed back until June. The Dynamic Beast crane barge was supposed to return to Victoria’s Inner Harbour in mid-May to remove the old blue steel. The project manager Jonathan Huggett says changes had to be made to the schedule because the crane is in high demand. It’s now scheduled to arrive in the capital city on June 8th and will work that weekend to remove four pieces of steel, including the counterweight truss, the tower truss as well as the east and west span. According to Huggett, the dynamic beast could arrive on June 7th if it completes its other project early. This week crews will saw and cut the concrete deck off the east side approach and that will take about two weeks. Posted: May 24th, 2018 under Bridge.